If you are one of the web-surfers with a lot of Google Chrome Apps on your browser and finding ways to organize them such as categorizing them, creating shortcuts for them in the Desktop or pinning them to taskbar & do much more, then this tutorial is for you. Go to Chrome Apps tab (Type chrome://apps in address bar). You can re-arrange them by dragging and placing them in appropriate locations. To create a new category or new Apps screen, drag an App to the right of the window until a right-arrow is seen. Hover over the right-arrow to create a new Apps screen and then, leave it. You can name the new Apps tab by double-clicking on the tab named “Apps” located below and entering the new category name. The default name for all App tabs is “Apps”. If you don’t want any name for the new Apps tab, delete the default name “Apps” and then, press Enter or else type your preferred category name and then, press Enter. You can also name the default Apps tab (i.e., the first tab) as you wish. To delete the created Apps tab, simply drag the Apps to the default Apps tab and leave it. Repeat these step until all Apps are removed from the created new Apps tab. Reload the page. Everything will be back to default. You can create shortcuts either on the Desktop or pin them to the taskbar. To do so, right-click on the App and select “Create shortcuts…”. Check the appropriate check-box (i.e., whether to create a shortcut on the Desktop or pin it to the taskbar) and select “Create”. You can also create shortcuts by right-clicking on the App and selecting “App info”. Then, select “Create shortcuts…”. You can open a Google Chrome App as window by right-clicking on it and selecting “Open as window”. Another way to do this is to right-click on the App and select “App info”. Then, choose appropriate option from the drop-down list. You cannot create App folders in the browser Apps tab. But, you can do it through the Chrome App Launcher. To do so, go here. Now, Chrome launcher will be added to your computer. You may re-arrange them by dragging. 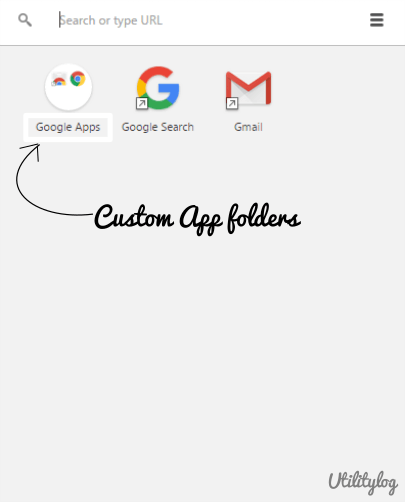 To create folders, simply drag an App over another App. Now, a new folder will be created. To name the folder, click on the folder and enter the name. To remove the folder, drag the App away from the folder. If you have more than two Apps in a same folder, repeat the above steps until only one app is left in the folder. You can also search or go to an URL through the Chrome App Launcher. To remove an App, simply drag it to the “Remove from Chrome” option located at the bottom of the screen. There are also other ways to do this — you can right-click on an App and select “Remove from Chrome…” or Right-click on an App and select “App info”, then select “Remove…”.